From the Baldwin County Courthouse, go east on Hancock St. and follow Highways 22/24 southeast for 2.0 miles. Turn left on Lake Laurel Rd. Go 5.0 miles. Turn left onto Gumm Cemetery Rd. Go straight on Gumm Cemetery Rd for 3.8 miles. At fork with Rocky Creek Dr., bear right on Mariner's Dr. Go 0.2 miles. Turn right onto Mariner's Court. Cemetery is in the wooded area to the right. Most of the graves are visible only in winter. The cemetery occupies the entire lot and is almost entirely unmarked graves. b. 1872 according to census and if the same person. Possibly m. to Mary Butts, according to 1900 and 1910 census. Rows of 4 or more graves extend throughout the cemetery. Possibly 50-100 graves total. Located on the edge of the cemetery near the street. 30 feet into woods from graves 4-6. 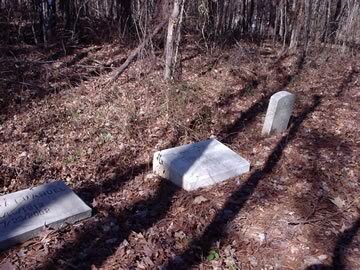 Two graves marked by fieldstones are next to it.